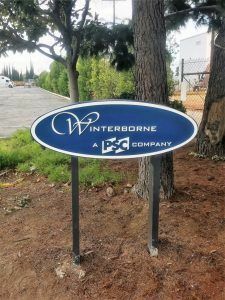 Winterborne, a product packaging company in our neighborhood, had a lot of existing exterior and interior signage. They were recently bought out by Pacific Southwest Container who was looking for a local sign company to update the existing signage. On top of adding their company name to the signs, they wanted to completely update some of the outdoor signs as they had experienced some wear over the years. The signs that needed work included a lobby sign, an exterior wall sign, a monument sign, and a post & panel sign. The lobby sign didn’t necessarily need to be replaced so instead of completely re-doing it, we added a cut vinyl graphic of Pacific Southwest Container’s logo to the bottom, underneath the existing Winterborne logo. We went on-site to get photos and measurements of the existing sign so we could lay out a good size for the graphic. There was limited space and we didn’t want the graphic to be too small or too large. For the outdoor signs, the updates were a little more extensive. The building sign was taken down completely and replaced with a new one that we made. Although it looked very similar to the existing sign and was the same size going the same area, the sign still needed to be permitted. They had considered just adding their logo like they did with the lobby sign, but since this sign was going to be seen by the publish, they decided to have a new one made. We made a few changes to the design on top of adding the logo. 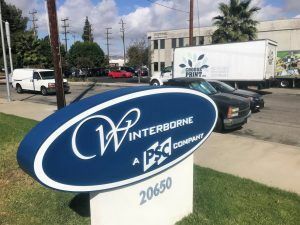 The Winterborne logo was scaled down a little to make room for Pacific Southwest Container’s logo so they were about the same size. We also added a white border as a nice accent. Unless a sign that is installed into the ground is in really bad shape, it’s rare that we replace the whole thing. Completely removing a monument sign and replacing it with a new one takes a lot of work and permitting. However, if just the faces are being replaced, the city does not require a permit. For the monument sign and post & panel sign, we removed the existing logo from the faces, sanded and repainted the blue section of the sign and created new dimensional letters with the new design. We can always refurbish an existing sign to look brand new for a fraction of the cost of building a new sign.